Earlier this year, Huawei passed Apple to become the second largest smartphone maker in the world, which is pretty impressive when you consider that the company’s best phones like the P20 Pro aren’t officially sold in the U.S. And because of the current business climate, where largely going to miss out on Huawei’s next big flagship too. It’s a real shame these phones will be hard to find in the US, because it feels like Huawei is really going all out for its new Mate 20 duo. Available in two flavors—the standard Mate 20 and Mate 20 Pro—the components in Huawei’s new phones reads like a checklist filled with all the major smartphones trends. The standard Mate 20 sports a huge 6.5-inch FHD+ (2244 by 1080) LCD display with what Huawei is calling a “Dewdrop” cutout at the top for its 24-MP selfie cam (it’s a notch), while the Mate 20 Pro sports a more traditional notch that has a 3D face scanning dot projector (like the kind Apple uses for FaceID), a 6.39-inch QHD+ (3120 by 1440) OLED display, and an in-screen fingerprint reader. Mate 20 Pro on the left, standard Mate 20 on the right. Yep, that’s right, outside of handful of concepts and special limited edition devices, the Mate 20 Pro will be one of the fast mass-market phones to feature tech that so many companies kept promising, but never actually delivered. But that’s just the start, because around back, both Mate 20's sport rather nice looking square camera modules with triple Leica cams. On the Mate 20 Pro, that setup is comprised of a 40-MP main cam, a 20-MP ultra wide-angle cam, and an 8-MP telephoto camera with a 3x zoom that offers even more reach than the zoom lenses in an iPhone XS or Galaxy Note 9. Meanwhile, the standard Mate 20 offers slightly less ambitious camera specs including a main 16-MP cam, a 12-MP ultra-wide cam, and a 8-MP telephoto cam with just a 2x zoom. This is one way to put a lot of cameras on a phone without making it look messy. Inside, the fun continues because the Mate 20 is also Huawei’s first phone to feature the company’s new homegrown Kirin 980 chipset that boasts a claimed 20-percent better performance and 40-percent increased energy efficiency, while also doubling down on the whole AI and machine learning hype with not one, but two built-in neural processing units (NPUs). Those NPUs, Huawei claims, gives the phone the ability to try out new AI-powered camera tricks like predictive auto-focus which uses the NPU to help better anticipate the movement of your subject, or selective color mode which uses the NPU to detect people and automatically change the pictures background to black-and-white while keeping the person in full color, all in real-time. In my brief time with the devices, both new camera features worked as advertised, even in the cramped and awkwardly lit demo room, though it’s still a bit too early to say Huawei nailed it just yet. Here’s an example of Mate 20's real-time selective color mode. And in terms of pure specs, the Mate 20 Pro is pushing battery capacity even further with a huge 4,200 mAh power pack, along with a healthy 6GB of RAM, 128GB of storage, microSD card slot, and a blazing 40-watt fast charge system. That’s more than twice the speed of the typical 18-watt fast charging found is most Android phones. And with all the extra battery, Huawei even included reverse wireless charging that can be used to fill up other devices using the Mate 20. The Mate 20 even includes wireless screen mirroring to nearby TVs and monitors via Miracast, and an IR blaster, which has become a rarity even among flagship devices nowadays. Annoyingly, only the standard Mate 20 offers a headphone jack. If you look close, you can see the faint pattern of the Mate 20's textured glass back. However, what’s most interesting to me is that the actual design of the Mate 20. 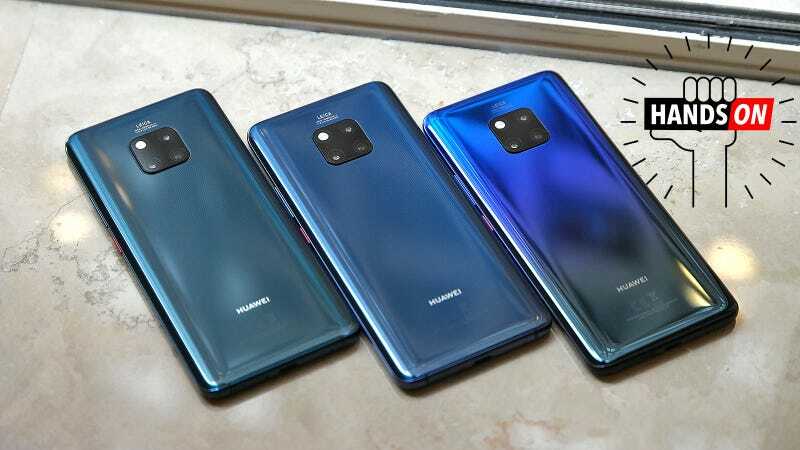 In the past, Huawei has often cribbed aspects of iPhone aesthetics, but this time, it seems Huawei was inspired by Samsung, because aside from their notches Mate 20 and Mate 20 Pro look and feel quite similar to a Galaxy S9. The back of the phone even features a subtle micro-texture that looks smooth, but actually feels like the ridges on a vinyl record. And in keeping with the gorgeous color options on the P20 Pro, the Mate 20 comes in a bunch of lovely hues and shades including emerald green, midnight blue, black, and pink gold. There’s even a new twilight gradient. Mate 20 Pro (left) and the Mate 20 (right). Contrasting colors on the power button is becoming a thing now too. Here’s a look at the twilight gradient on a standard Mate 20. From the back, you can tell the two Mate 20's apart due to the Mate 20's rear fingerprint sensor. Top sides of the Mate 20 and Mate 20 Pro, the only other port is a USB-C jack on bottom. On the Mate 20 Pro, Huawei is really is throwing everything it can into its new phone, which is interesting, because it’s almost the exact opposite strategy Google took on the Pixel 3, which has largely side-stepped the traditional specs arms race in favor of focusing on the phone’s software. Now here comes the bad part, because while the Mate 20 and Mate 20 Pro will be available for purchase in the U.S. through select online retailers, the models we’ll get are the standard unlocked international versions. That means no support for CDMA carriers like Verizon and Sprint, and at this time, unknown compatibility for advanced 4GLTE features like carrier aggregation on GSM networks. So even if you can get your hands on a Mate 20 in the States, its wireless speeds might be handicapped in comparison to other handsets, despite having what should be a super fast CAT 21 gigabit modem. The Mate 20 and Mate Pro should be available sometime later year, and while we don’t have an official price or release date yet, if the Mate 10 and P20 are any indication, they won’t be cheap. [Update: 10 AM ET] Here are the official European prices for the Mate 20 and Mate 20 Pro. The Mate 20 starts at 800 euros (around $925) for the 4GB/128GB model , while the Mate 20 Pro starts at 1050 euros (around $1,215) for the 6GB/128GB version. And as Huawei has done in past, there’s also an even more expensive Porsche Design version of the Mate 20 Pro with a leather back, 8GB of RAM, and 256GB of storage for a whopping 1,700 euros, which converts to just shy of $2,000. Yikes.